I love a good panzanella. What’s not to like? 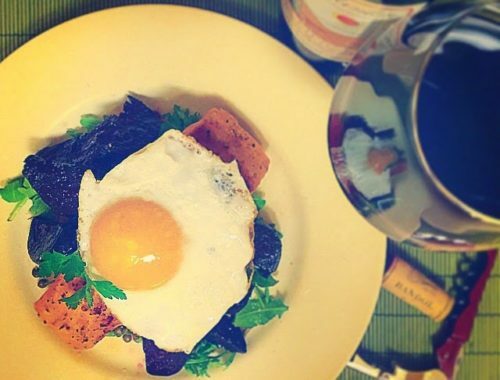 It’s a salad made out of bread…which makes us all feel better about eating a large bowl of bread. You can pretty much make a panzanella out of any type of stale bread, cheese and vegetables. 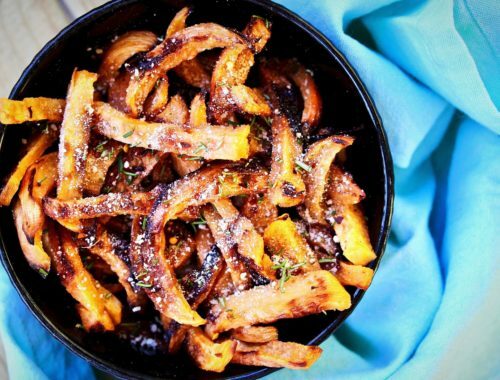 I’ve even done it in the fall/winter with whole grain bread, roasted butternut squash and sage. But I really love them in the summer. I’m using garden-fresh corn, tomatoes and tarragon and pairing them with basil pesto, store-bought chicken sausage and homemade cheesy-garlicky croutons and it was awesome. But I encourage you to use up whatever you happen to have on hand, it’s pretty hard to mess this up. -In a large serving bowl, place 3/4 cup of your favorite basil pesto (make it yourself or buy your own) and add about 2 tsp of red wine vinegar. Stir well. Cut 2-3 garden ripe tomatoes into bite sized chunks and add to the pesto. Stir and allow the salt from the pesto to bring out the juice in the tomatoes while you prepare the rest of your salad components. 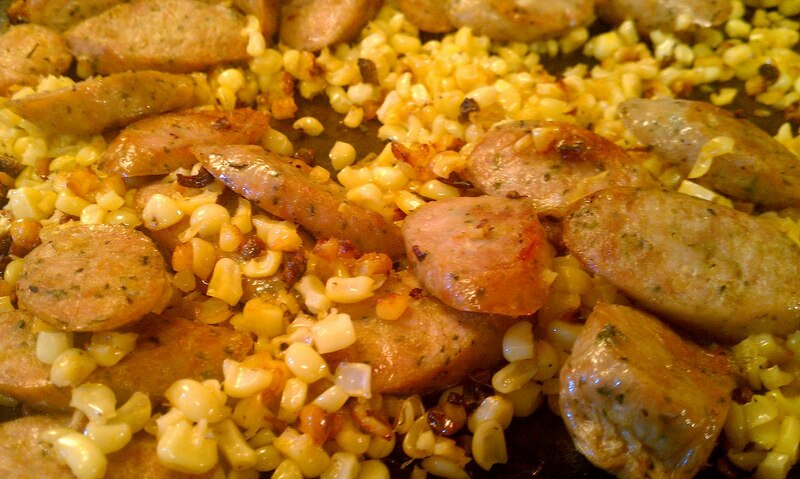 -On another sheet pan, place the kernels of 3 ears of corn and 12 ounces of your favorite savory cooked chicken (or pork) sausage, sliced on the bias into bite-sized pieces. 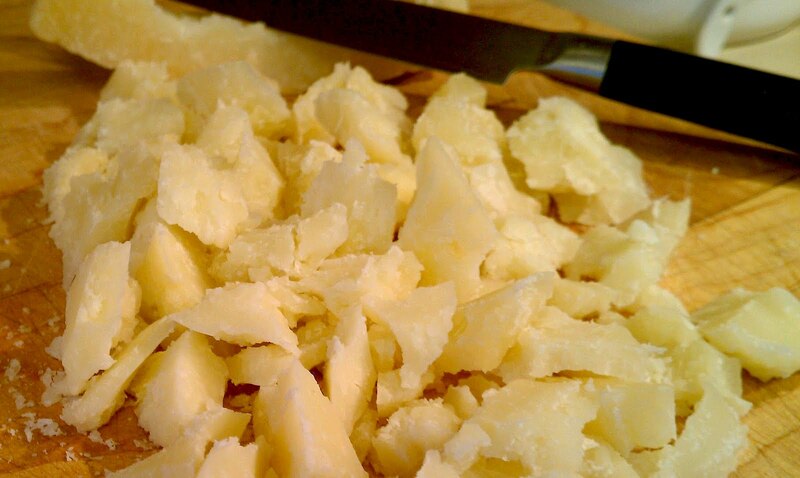 Toss in some olive oil, and season with salt, pepper, and a bit of sugar. Place in the same oven to cook with the croutons for a total of 30 minutes, until golden brown. 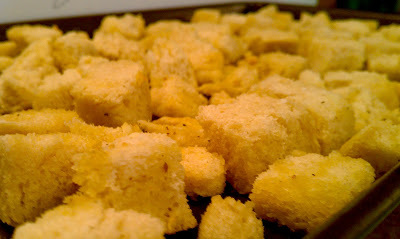 -While your croutons, corn and sausage are roasting, take the point of a sharp knife and dig into your 1/2 lb. wedge of Pecorino cheese, breaking off bite-sized crumbles. Set aside. 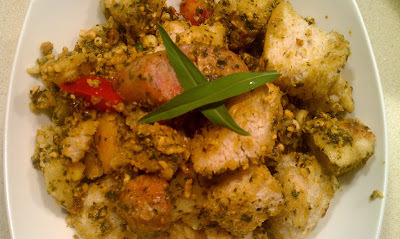 -Add your croutons to the bowl with your pesto and tomatoes first and toss to combine. Then add the rest of your components and a small handful of chopped fresh tarragon leaves.